rCsad inuicem adhac crant-; ab era lit cm m lolumtfifi-do miri: fee, zo. appituirin hifeeobfcruatioCibns oi;-cidcntalis Stella litis txigua. mini 6. occîdent.dis verù S - or parte orientai; Stella <juxdam admodum exigu a à loue diftabar minuris fe-eundis 20. fiSâmad vngucm defignabant lincam. Figure 15.5: Galileo's Discovery of Four Satellites of Jupiter. A Page from Galileo, Sidereus nuncius, 1610. On February first, the second hour of the night, the formation was similar. The eastern star 6 minutes from Jupiter, the western one 8. To the east a very small star 20 seconds distance from Jupiter, in a straight line. On February second, a star to the east 6 minutes from Jupiter. Jupiter 4 minutes from the nearer one to the west; and 8 minutes between the two western stars. In a straight line and of nearly equal magnitude. At the seventh hour there were four stars, Jupiter occupying the middle. The easternmost 4 minutes from the next, and that 1 minute, 40 second from Jupiter. Jupiter 6 minutes from the closest western one, and that one 8 minutes from the westernmost one. They were on the same straight line, an extension in longitude of the zodiac. Source: Translation after Albert van Helden, Sidereus Nuncius or The Sidereal Messenger. Galileo Galilei. Translated with introduction, conclusion, and notes by Albert van Helden (Chicago: University of Chicago Press, 1989), p. 74. Image copyright History of Science Collections, University of Oklahoma Libraries. (juas Iuppitcr mcdïam occupa bat federn .-Harum Stella™ m oricnta!fc>r diftabatà fèquenti min: 4. Iiascàlo* tic min: 1. ici: 4"J. 1 up [liter at) oc tide n tali fibi vicinio-jx ¡¿erat rain: 6. lue veto ab octidentaliod min.8. trau tqac panier omnés in cadem recta linca, fecund5 Zudiaci longitudinetn eïtenia. Galileo named the four objects never before seen the Medicean Stars, after Cosimo II de Medici, the Grand Duke of Tuscany. In his introduction to the Starry Messenger, Galileo noted that marble and bronze statues, columns, and pyramids are constructed to pass down for the memory of posterity names deserving immortality. All, however, perish in the end. The fame of Jupiter, Mars, Mercury, and Hercules, on the other hand, enjoy with the stars eternal life. Now, just as the immortal graces of Cosimo's soul had begun to shine forth on Earth, bright stars offered themselves like tongues to speak of and celebrate his most excellent virtues for all time. These words would not have seemed overly obsequious to Galileo's contemporaries living in a hierarchically ordered society. Then, kings and dukes subsidized economically unproductive occupations such as painting, music, literature, and science. Now, democracies need to find replacements for royal patronage. That spring, at Easter, Galileo traveled to Florence to demonstrate the use of the telescope and personally show the new stars to Cosimo. Cosimo responded as Galileo had hoped, inviting Galileo to take up residence in Florence that July as mathematician and philosopher to the grand duke, and also as chief mathematician of the University of Pisa, without obligation to teach. That fall or winter, Galileo focused an improved telescope on Venus, which had moved on from its summer conjunction with the Sun and was now visible in the evening sky. Were Venus a planet like the Earth, rather than a wandering self-illuminated star, and shining with light borrowed from the Sun, it should show phases, as does the Moon. A former pupil wrote to Galileo: "Since (as I believe) the opinion of Copernicus that Venus revolves about the Sun is correct, it is clear that she would necessarily be seen by us sometimes horned and sometimes not . . . Now I would like to know from you if you, with your wonderful spyglasses, have noticed such an appearance, which, without doubt, will be a sure means of convincing any obstinate mind" (van Helden, Sidereus Nuncius, 106). To ensure credit to himself for just such a discovery, Galileo immediately wrote to the Tuscan ambassador in Prague that he had observed a phenomenon arguing strongly for the Copernican system. Perhaps Galileo only began to study Venus after being alerted to the possibility of phases: he stole credit for the idea. Or perhaps Galileo had been observing Venus for months, as he later claimed: all the credit is rightfully his, for the idea as well as for the actual observation. The increase in apparent size was the result of Venus coming nearer the Earth. Galileo's observations were consistent with the Copernican system but not with the Ptolemaic system. Venus changed shape precisely as does the Moon. Galileo concluded, in another letter: "These things leave no room for doubt about the orbit of Venus. With absolute necessity we shall conclude, in agreement with the theories of the Pythagoreans and of Copernicus, that Venus revolves about the Sun just as do all the other planets. Hence it is not necessary to wait for transits and occultations of Venus to make certain of so obvious a conclusion" (Drake, Discoveries, 93-94). A transit of Venus occurs when the planet passes across the face of the Sun; an occultation occurs when a body passes behind the Sun. The tiny speck of Venus on the face of the Sun would not be observed until 1639. 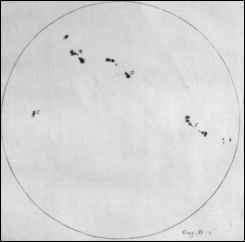 Another telescopic observation with revolutionary implications was of sun-spots. 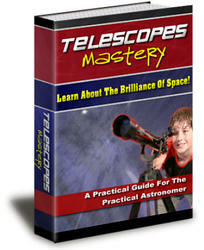 Several astronomers, including Galileo, independently observed them in 1610 and 1611. The Sun was found to be blemished, as were the Earth and the Moon. Not only did this observation contradict Aristotelian physics, but it would open the door to extending physical principles applicable to terrestrial phenomena also to celestial phenomena, as Isaac Newton would famously do later in the century. Figure 15.6: Phases of Venus in Ptolemaic and Copernican Models. In both the Ptolemaic geocentric model on the left and the Copernican heliocentric model on the right, Venus appears much larger when it is closest to the Earth, between 6 and 1, than when it is farthest from the Earth, between 3 and 4. 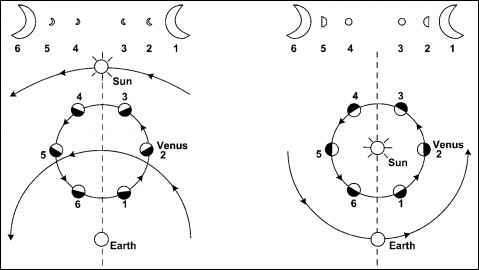 In the Copernican model, Venus, shining with light borrowed from the Sun, exhibits a full range of phases, from new (between 6 and 1) through crescent to full (between 3 and 4). In the Ptolemaic model, however, Venus does not display a full phase to observers on the Earth. Source: After Albert van Helden, Sidereus Nuncius or The Sidereal Messenger. Galileo Galilei. Translated with introduction, conclusion, and notes by Albert van Helden (Chicago: University of Chicago Press, 1989), p. 108. 1612. Sunspots are irregularly shaped dark areas on the surface of the Sun, often large enough (tens of thousands of miles in diameter) to be visible without a telescope. The Greek philosopher Anaxagoras may have seen a sunspot in 467 b.c., and Chinese records of sun-spots date from 28 b.c. According to Aristotle, however, the heavens were perfect and unchanging. Hence, a large spot persisting for eight days in 807 was thought to be Mercury passing in front of the Sun. The number of sunspots has a 22-year cycle from minimum to maximum activity and back to minimum activity. From a.d. 1645 to a.d. 1715 sunspots were very rare; fewer were seen during the entire period than are now seen in a single year. Climate changes seem to be linked to solar activity. Image copyright History of Science Collections, University of Oklahoma Libraries. to it with regular motions." Indeed, the spots described "lines on the face of the Sun similar to those along which Venus and Mercury proceed when those planets come between the Sun and our eyes" (Drake, Discoveries, 91). Nor were the spots objects located in the Earth's atmosphere. That close, they would have displayed an easily perceptible parallax. Nor were sunspots satellites circling the Sun. The companions of Jupiter were constant in appearance, with regular and definite periods. Sunspots, on the other hand, were generated and decayed in longer and shorter periods. Some condensed and others expanded, and some were most irregular. And their speeds across the face of the Sun varied. From analogy with terrestrial phenomena, it clearly followed "that no material of ours better imitates the properties of these spots than terrestrial clouds" (Drake, Discoveries, 99). 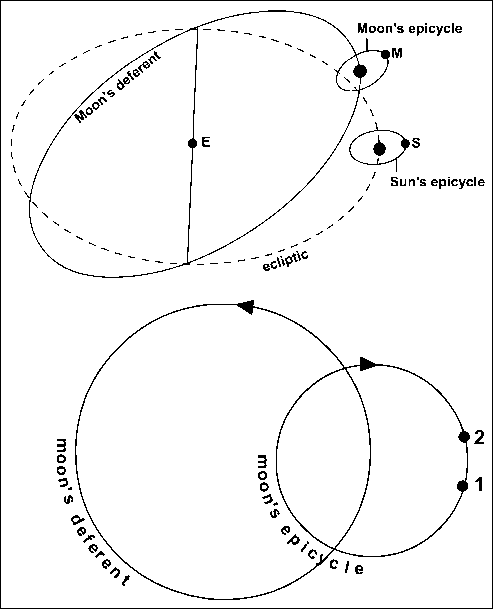 In Galileo's opinion: "[T]he solar spots are produced and dissolve upon the surface of the Sun and are contiguous to it, while the Sun, rotating upon its axis in about one lunar month, carries them along, perhaps bringing back some of those that are of longer duration than a month, but so changed in shape and pattern, that it is not easy for us to recognize them" (Drake, Discoveries, 102). Albert Einstein recognized in Galileo a passionate fighter against dogma based on authority. ■ debate over whether sunspots are contiguous to the Sun or satellites of the . Orazio Grassi, professor of mathematics at the Collegio Romano, gave a public lecture on comets. A manuscript copy of the lecture was sent to Galileo, and the lecture was published in 1619 as On the Three Comets of the Year MDCXVIII. An Astronomical Disputation Presented Publicly in the Collegio Romano of the Society of Jesus by one of the Fathers of that same Society. Galileo drafted a critique of Grassi's work, and a pupil published it as Discourse on the Comets. By Mario Guiducci. Delivered at the Florentine Academy during his Term as Consul. Grassi angrily replied in a book of his own, though under the pseudonym Lothario Sarsi: The Astronomical Balance, on which the Opinions of Galileo Galilei regarding Comets are weighed, as well as those presented in the Florentine Academy by Mario Guiducci and recently published. 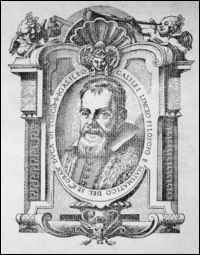 In 1623 Galileo's friend and supporter Cardinal Maffeo Barberini became Pope Urban VIII, and Galileo replied to Grassi's attack with The Assayer, dedicated to the pope, who then told Galileo that he could write about the Copernican theory as a mathematical hypothesis. Image copyright History of Science Collections, University of Oklahoma Libraries. That Galileo was presenting merely a mathematical hypothesis, not necessarily the true system of the world, was itself a fiction. This fiction was necessary because in 1616 the Congregation of the Index had issued an edict forbidding assertion of literal truth for the motion of the Earth and the stability of the Sun. But hypothetical discussions of Copernican astronomy were permissible. Galileo wrote in his preface to the discerning reader that he accepted the "salutary edict which, in order to obviate the dangerous tendencies of our present age, imposed a seasonable silence upon the Pythagorean opinion that the Earth moves" (Drake, Dialogue, 5). In answer to "those who impudently asserted that this decree had its origin not in judicious inquiry, but in passion none too well informed," Galileo would "show to foreign nations that as much is understood of this matter in Italy, and particularly in Rome [i.e., the Church], as transalpine [the Protestant Reformation was occurring north of the Alps] diligence can ever have imagined" (Drake, Dialogue, 5). This was just what the pope wanted: a demonstration that the Catholic Church did not interfere with the pursuit of science. Galileo's dialogue was between Salviati, "a sublime intellect which fed no more hungrily upon any pleasure than it did upon fine meditations," and Simplicio, "a Peripatetic philosopher whose greatest obstacle in apprehending the truth seemed to be the reputation he had acquired by his interpretations of Aristotle" (Drake, Dialogue, 7). Sagredo, "a man of noble extraction and trenchant wit" (Drake, Dialogue, 7), was mainly an onlooker to the debate but also an occasional commentator. Simplicio, though neither as smart nor as well informed as Salviati, was not a simpleton. He was named after the sixth-century philosopher Simplicius, who wrote commentaries on Aristotle's Physics and On the Heavens. In Simplicio's mouth, Galileo unwisely placed arguments personally made to him by the pope. Figure 15.9: Frontispiece, Dialogo di Galileo Galilei. The Dialogo sopra i due massimi sistemi del mondo (Dialogue Concerning the Two Chief World Systems) was published in Florence in 1632 under a formal license from the Inquisition. 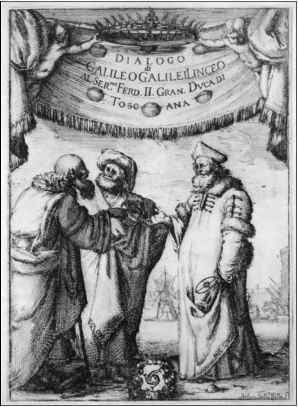 The title on the title page is Dialogo, followed by Galileo's name and references to his membership in the Accademia dei Lincei and his employment then under the Grand Duke Ferdinand II of Tuscany, son of Cosimo II, Galileo's earlier patron who had died in 1620. Image copyright History of Science Collections, University of Oklahoma Libraries. Salviati: Now experiment shows the shots to fall equally; therefore the cannon is motionless, and consequently the Earth is, too. Not only this, but shots to the south or north likewise confirm the stability of the Earth; for they would never hit the mark that one had aimed at, but would always slant toward the west because of the travel that would be made toward the east by the target, carried by the Earth while the ball was in the air. Simplicio: Oh, these are excellent arguments, to which it will be impossible to find a valid answer. Salviati: Perhaps they are new to you? Simplicio: Yes, indeed, and now I see with how many elegant experiments nature graciously wishes to aid us in coming to the recognition of the truth . . . Sagredo: What a shame there were no cannons in Aristotle's time! With them he would indeed have battered down ignorance, and spoken without the least hesitation concerning the universe. Salviati: It suits me very well that these arguments are new to you, for now you will not remain of the same opinion as most Peripatetics, who believe that anyone who departs from Aristotle's doctrine must therefore have failed to understand his proofs. . . .
Tell me Simplicio Do you feel convinced that the experiment on the ship squares so well with our purpose that one may reasonably believe that whatever is seen to occur there must also take place on the terrestrial globe? . . . Simplicio: So far, yes . . .
Salviati: Rather, I hope that you will stick to it, and firmly insist that the result on the Earth must correspond to that on the ship, so that when the latter is perceived to be prejudicial to your case you will not be tempted to change your mind . . . Very good. Now, have you ever made this experiment of the ship? Simplicio: I have never made it, but I certainly believe that the authorities who adduced it had carefully observed it. Besides, the cause of the difference is so exactly known that there is no room for doubt. Galileo has refuted the Aristotelian argument against motion of the Earth but has not proven motion of the Earth: neither motion nor rest can be inferred from the experiment. Simplicio: If you had referred me to any other agency than experiment, I think that our dispute would not soon come to an end; for this appears to me to be a thing so remote from human reason that there is no place in it for credulity or probability. Salviati: For me there is, just the same. Simplicio: So you have not made a hundred tests, or even one? And yet you so freely declare it to be certain? I shall retain my incredulity, and my own confidence that the experiment has been made by the most important authors who make use of it, and that it shows what they say it does. Salviati: Without experiment, I am sure that the effect will happen as I tell you, because it must happen that way; and I might add that you yourself also know that it cannot happen otherwise, no matter how you may pretend not to know it—or give that impression. But I am so handy at picking people's brains that I shall make you confess this in spite of yourself . . . If only Simplicio is willing to reply to my interrogation, I cannot fail . . .
Now as to that stone which is on top of the mast; does it not move, carried by the ship, both of them going along the circumference of a circle about its center? And consequently is there not in it an ineradicable motion, all external impediments being removed? And is not this motion as fast as that of the ship? Simplicio: All this is true, but what next? Salviati: Go on and draw the final consequence by yourself, if by yourself you have known all the premises. Simplicio: By the final conclusion you mean that the stone, moving with an indelibly impressed motion, is not going to leave the ship, but will follow it, and finally will fall at the same place where it fell when the ship remained motionless . . . This argument is really very plausible in appearance, but actually it is offset by a difficulty which is hard to overcome. You have made an assumption throughout which will not lightly be granted by the Peripatetic school, being directly contrary to Aristotle. You take it as well known and evident that the projectile when separated from its origin retains the motion which was forcibly impressed upon it there . . . So the rock cannot follow the motion of the boat either through any force impressed upon it . . . and therefore it will remain behind. Galileo proceeded to ridicule the Aristotelian alternatives to impressed motion. Destroying Aristotelian physics and replacing it with a new physics hospitable to motion of the Earth was a major part of the Copernican revolution, and necessary for its acceptance. Galileo's telescopic discoveries, logical implications of the Copernican system, and the principle of plenitude, which interpreted any unrealized potential in nature as a restriction of the Creator's power, all combined to encourage belief in a plurality of worlds. John Wilkins, a major figure in the establishment of the Royal Society of London and its first secretary, argued the case in his 1638 book The Discovery of a New World: or, a Discourse tending to prove, that it is probable there may be another habitable World in the Moon. Although there was no direct evidence of lunar inhabitants, Wilkins guessed that there were some inhabitants. Why else would Providence have furnished the Moon with all the conveniences of habitation shared by the Earth? Persistent rumors that England intended to colonize the Moon further spread the idea of a plurality of worlds and the new Copernican astronomy, although the supposed plan was to send colonists to an empty Moon, not to subjugate indigenous lunar inhabitants. The rumors were perhaps begun by Wilkins's quotation of the astronomer Johannes Kepler, who had predicted that as the art of flying was developed, the successful nation would transplant a colony to the Moon. Once the barrier in human imagination against extraterrestrial life was breached by imaginary lunar inhabitants, the concept of a plurality of worlds quickly spread to the planets, and then beyond our solar system to other planets circling other suns. In 1686 the French astronomer, mathematician, and writer Bernard Fontenelle published his Entretiens sur la pluralité des mondes (Conversations on the Plurality of Worlds). The book was an instant best-seller, made it onto the Catholic index of prohibited books, and continues to be read today. Fontenelle may have been inspired by Wilkins's book on a habitable world in the Moon, which was published, in French translation, in Fontenelle's hometown in 1655 (two years before Fontenelle's birth). Fontenelle's book describes his imagined evening promenades in a garden with a lovely young marquise. Naturally, their conversation turned to astronomy. On the second evening, the hero explained to his eager and enthusiastic companion that the Moon was une terre habite, although an absence of atmosphere might change that conclusion. On the third night, he continued with the idea that the planets were also inhabited. On the fifth and final night, he argued that the fixed stars were other suns, each giving light to their own worlds. What a romantic flirtation! Fontenelle was not explicitly a feminist. He did, however, take seriously women's intellectual ambitions. In this he was not typical of male intellectuals of his time. In 1672 Molière in his comedy Les Femmes Savantes had mocked women for trying to better themselves, for involving themselves in anything other than trivial, mindless pursuits—damned if they did think, and damned if they did not. Fontenelle helped open a market for women readers, perhaps even more in England than in France. In 1713 an English newspaper described a mother and her daughters making jam while reading Fontenelle aloud to each other. From passive consumers of scientific information to active participants in scientific investigations would be the next step for women. Seeking origins of the feminist social revolution in the Copernican scientific revolution is a tenuous but not entirely implausible quest. Above all, the Copernican revolution was a revolution in our understanding of our place and meaning in the universe. The revolution saw a historical progression from belief in a small universe with humankind at its center to a larger, and eventually infinite, universe with the Earth not in the center. The physical geometry of our universe was transformed from geocentric and homocentric to heliocentric, and eventually to a-centric. The psychological change was no less. We no longer command unique status as residents of the center of the universe, enjoying our privileged place. Nor are we likely the only rational beings in the universe. One might even question whether a good God sent an Adam and an Eve and a Jesus Christ only to us, or to every planet.